On October 24, Jaylen Ray Fryberg, a student at Marysville-Pilchuck High School in Washington state, entered the cafeteria and shot five schoolmates, all sitting at the same table, before exiting the building and eventually turning the gun on himself. The presence of mobile phones meant that news of the shooting would make it out of the school before the shooter did. The story was being broadcast nationally by the time emergency workers were on the scene, with reporters acknowledging as they spoke to witnesses that the details were still not fully known. Classmates, teachers, and parents reacted with shock, everyone saying the attack was completely out of character for boy they knew. Details were sparse as reporters speculated on recent events in his life and what may have contributed to his state of mind leading up to the attack. Though a clearer picture has emerged over the few days since the shooting, days later the community still looks for answers. None of that deterred Anita Sarkeesian, who gleefully pounced within hours of the shooting to claim the phenomenon it belongs to as proof of her ideology. She couldn’t even wait for a body count before jumping in to exploit the tragedy as a source of publicity for herself and a podium at which to preach her beliefs to the masses. Ignoring the splintered, fractured picture that emerging information painted, Sarkeesian immediately began telling The Story Of School Shootings As Feminism Sees Them, spouting the same tired old male-demonizing rhetoric and statistics. Feminists would have you believe that violence is a male trait. They cite events like this as evidence, providing us with yet another example of the way social justice ideologues selectively present information to create a false impression. The majority of incidents that get labeled “mass” or “school” shootings … aren’t. On October 12 of this year, New York Post writer John R. Lott Jr. evaluated an FBI-cited study that had been used by the press to create the impression that there had been a severe increase in mass shootings during the past 14 years. He reported that 67 of the 160 cases included in the study involved cases in which one person or fewer were killed. Fifty of those were during the second seven years. At the same time, the study ignored 20 mass shootings that occurred in the first seven years, creating the false impression of dramatic increase. Lott also explained that expanding the scope of one’s search to include years going back to 1977 showed that the change was not nearly as much as the FBI and news media claimed. Lott went on to point out an even more poorly backed statistic, the claim promoted last summer by Michael Bloom­berg’s Everytown for Gun Safety, that there had been 74 school shootings since Sandy Hook. Politifact debunked the statistic, which had been widely reported and even vaguely referred to by President Obama in a speech. Out of the 74 incidents cited, only 10 involved a student attacking other students with intent to commit mass murder. More than half involved criminal activity or personal altercations. The statistic was manufactured by Bloomberg to support a political agenda. The feminist treatment of these types of attacks as a male (particularly white male) behavior is similarly bogus. and linked to an article containing claims that conflated school shooters with mass shooters whose crimes did not occur at any school. The writer also asserted that shooters were overwhelmingly white. The lists cited at the link are incomplete, comprised mostly of incidents that were not school shootings. Only 7 of the 31 shootings mentioned on the first list, and only 10 of the 62 mentioned on the second list, took place at schools. Both lists, contrary to Sarkeesian’s claims about toxic masculinity, contained incidents in which contributing factors included mental health issues and dramatic changes in life circumstances. Both lists excluded shooters who would contradict the writer’s generalization. According to Psychology Today‘s Peter Langman, Ph.D., discussions about school shooters regularly exclude minority and female perpetrators. The Mother Jones article that Feminist Current referenced traced mass shootings back to 1982. The first female shooter on Dr. Langman’s list acted three years prior, in 1979. Laurie Dan’s story is too long and bizarre to summarize in a single paragraph. Her killing spree included, but was not limited to, a school shooting. Were she a man, feminists would highlight an unhealthy attachment to girls, a possessive attitude toward his ex-wife, harassment of his ex-girlfriend, and creepy obsession with children … but who says things like that about women? Jillian Robbins [referred to as Jillian Spencer in Dr. Langman’s list, which after fact-checking I believe to be an error] actually warned medical personnel that she was going to kill people, according to the Post Gazette. Had she been male, her statement might have been taken more seriously, and her treatment extended. Instead, she was released and opened fire on random students at Penn State University, killing Melanie Spalla. Is that an example of toxic femininity? Latina Williams did not leave any clues as to the motive behind her 2008 crime at Louisiana Technical Institute. After Amy Bishop shot and killed several of her colleagues at the University of Alabama after being denied tenure, authorities learned her past held a dark, tragic secret. Distraught over a breakup and bad grades, 14-year-old Heather Smith, not included in Dr. Langman’s list, shot her ex-boyfriend and a girl who tried to stop her, then shot herself. The shooting occurred at Spanaway Junior High School in Spanaway, Washington, in 1985. Also missing from the list was Elizabeth Bush, who on March 7, 2001 entered Bishop Neumann Junior-Senior High School and fired on 13-year-old Kimberly Marchese. 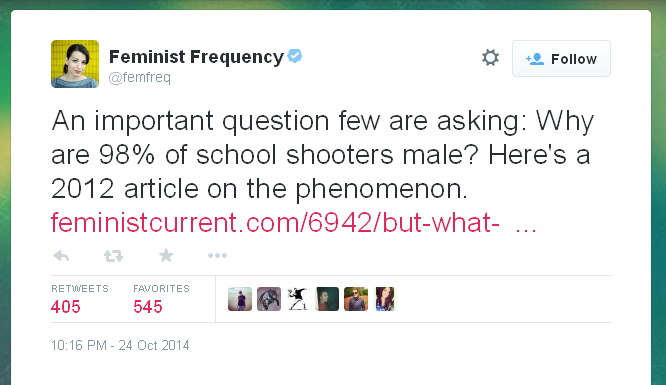 Afterward, she blamed mental health issues, a factor which often gets ignored when the shooter is male. The Mother Jones timeline of mass murderers was also incomplete, but that is partly due to the fact that female mass murderers don’t necessarily use guns. Yeah, no. The response didn’t inspire any such reflection. She didn’t even think about it. Instead, she whined about being contradicted and about having a hard time using the tragedy to raise funds. Oh, look, a tragedy that doesn’t involve me at all! However can I make myself the victim of it? OMG, why do people get so upset when I generalize and demonize them? Her damseling has been featured in a blog post by David Futrelle. 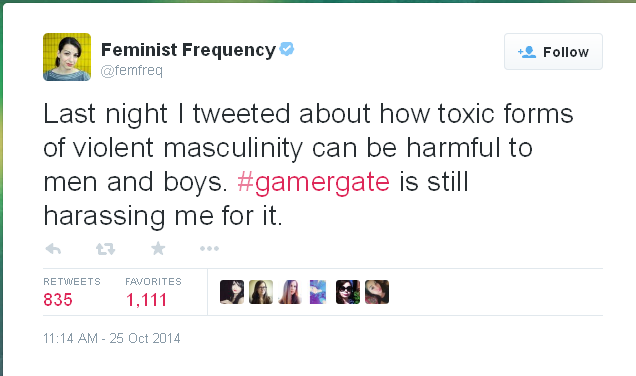 Futrelle treated her use of the tragedy as a brush with which to paint all men and boys as a reasonable and not at all sexist approach, and following Sarkeesian’s lead, he proceeded to blame a handful of angry tweets from random Twitter accounts on #GamerGate, despite no mention of the hashtag being included in any of the tweets. It seems that these social justice warriors are just so accustomed to exploiting other people’s experiences that they’re comfortable using a yet uncertain body count as a podium at which to spout their hateful rhetoric. They feel so entitled to it that they resent criticism and are inclined to treat expressed outrage over their crass and insensitive approach as an illegitimate response. It does not matter to them that their claims project one individual’s clear dysfunction onto millions of innocent, unrelated, and unconnected individuals. It does not matter to them that human dysfunction is influenced by a multitude of factors, not limited to characteristics they wish to disparage. Like any other bigot, they do not care about the impact or inference of their prejudiced statements on the group they’re generalizing. Why be concerned that one is dehumanizing a group that one considers less than human already? Calculatingly bigoted, callously opportunistic, pitifully whiny, and transparently hypocritical: this is what toxic feminism looks like. Thanks, Anita, for once again putting your movement’s nature on display. If you like what you read, please consider becoming Hannah Wallen’s patron. The Brigade runs on donations by readers like you. Fantastic Article Hannah (just like all of your pieces). When I heard about her twitter post, I was absolutely furious! For her to have the audacity to use a tragic event as a platform for her feminist ideology, while not at all expressing condolences to the families of the victims is beyond low. And the problem is that she will be defended until the end of the earth because she is a “victim.” She will never be called out for her actions. There is nothing that will change that, all because she is a woman. 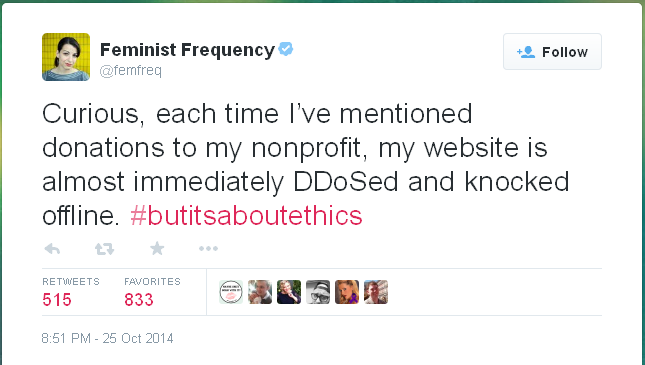 You could say Anita is an ambulance chaser. If Al Sharpton was a white girl who favored flannel and hoop earings he’d be Anita Sarkeesian. Thanks for fighting the good fight, ladies. I also loved how she went from murdergasm to “buy this book!” in one single digital breath. I havent checked to see if she’s cleaned up her twitter stream or not, but there’s archives of it over on various gamergate related forums. As an aside, the folks over at #gamergate found the guy sending her threats, she blocked the people giving her the details to forward to the FBI. It’s about ethics, even when others fail to live up to them. Thank you for being a voice of sanity and rationality as the rest of the nation is becoming obsessed with the poison of identity politics. As a gamer and nerd, I have never felt more ostracized from my own community before these agenda pushers barged in. The Felicia Day thing happening recently is an example of how this divisiveness is being pushed everywhere under the religious tenets of the moral authoritarianism that make up identity politics. I have enormous respect for Felicia as part of gaming culture and due to the biased MSM whipped into a froth by these special interests spinning half truths she is terrified of male gamers. They are trying to make natural sexuality and male hobbies an evil sin to promote their personal agenda and standing in the world. It isn’t right. the weight of the tone policing begin in that industry as well. The end goal of these people seems to be censorship and complete thought control. C.H. Sommers has also been amazing in this and has been disavowed as ‘not a real feminist’ and is now receiving threats of her own. https://archive.today/0layc As soon as you disagree with these people on the methods they are using, they excommunicate you. Is she related to Joseph Goebbels? Sorry Joe, even Nazis had limits.